Over the years bridesmaids have often enjoyed mixed fates. Some have been blessed with beautiful and highly flattering gowns to wear upon that blessed wedding day, whilst others have been turned into walking meringues for the day. But is it necessary to go for the classic matching bridesmaids in traditional bridesmaid dresses look? Or is it time to let Bridesmaids have a little more individuality in their outfits? Time to battle it out! In the Red Corner, fighting for individual styles, for her own wedding she set out to make pretty much everything very individual, including the Island we chose to get married on where we were pretty much the only wedding that year… it’s Dom “The Tog Bride”. Dom: It’s incredibly difficult to find a dress that suits everyone’s colouring, style and body shape and chances are if you’ve chosen the same dress for everyone that it’s really not going to suit someone or that at least one person might feel uncomfortable in it. Matt: It’s traditional for all of the Bridesmaids to look the same and it helps to identify their important role as key members of the wedding party. Dom: Your Bridesmaids are supposed to be your closest friends or relatives – surely you want them to feel great on your wedding day and look their best, and allowing them a little individuality (perhaps within certain guidelines) is the best way to do that. Matt: But whilst you want the Bridesmaids to feel comfortable the dresses aren’t really about them as such, a huge part of their role is to make the bride look even better and a bride in white surrounded by matching bridesmaids makes a huge visual impact whilst making the bride really stand out from those around her. Dom: But all eyes will always be on the bride anyway, giving the bridesmaids an individual twist isn’t going to change that! 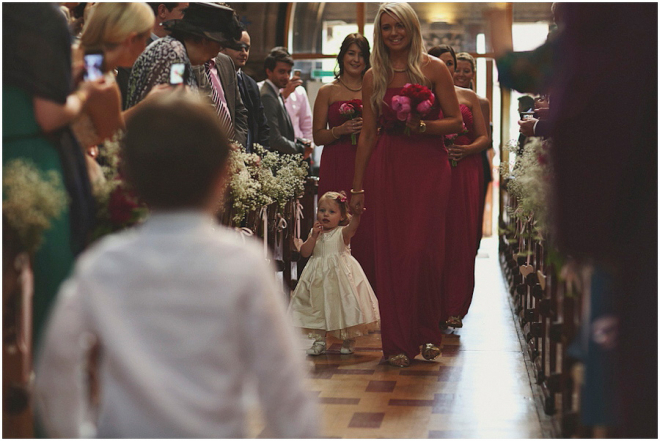 Having the Bridesmaids mismatched can often make even more of an impact and add an extra dimension to the look! Matt: Letting everyone have different styles of dresses could potentially lead to arguments if one person feels their dress isn’t as good as the others or as expensive etc. Having them all the same means everyone is on a completely level playing field. Dom: Arguments are just as likely though if one person feels that the dresses have been chosen to make one particular bridesmaid look good and they can end up feeling left out and resentful. If everyone is allowed to choose their own dress surely there’s less room for petty squabbles! Matt: The Bridesmaids dresses generally play a huge part in defining your overall wedding colour scheme. They usually match not only each other but also blend in with the wedding decoration and accessories. Dom: But lots of people have more than one colour in their scheme and all the different colours can be represented in mismatched dresses. But even if the dresses aren’t all the same they can still be the same colour and length but just vary in style and shape to best compliment each lady’s figure – for example everyone could be in purple but some might go strapless and others not. Matt: But if you are asking your bridesmaids to wear the same colour but giving them freedom in terms of the style there’s a real danger that one of your bridesmaids could end up really standing out massively from the others – for example all of your bridesmaids might choose a long dress except one who prefers something much shorter and if only one of them stands out they may feel embarrassed and the guests might think them more important than the others. So these are our arguments but where do you stand? Place your votes in our poll below or leave a comment to join the debate!